Sometimes an activity takes over a year to come together. I have had these cardboard buckets for a long time. I bought them at a chain craft store and had no idea what I was going to do with them. With St. Patrick’s Day coming up, I decided that we could make a Leprechaun Pot of Gold. The kids had a blast turning their buckets into leprechauns and we used them in a St. Patrick’s Day Treasure Hunt. It’s easy to make a leprechaun pot of gold! 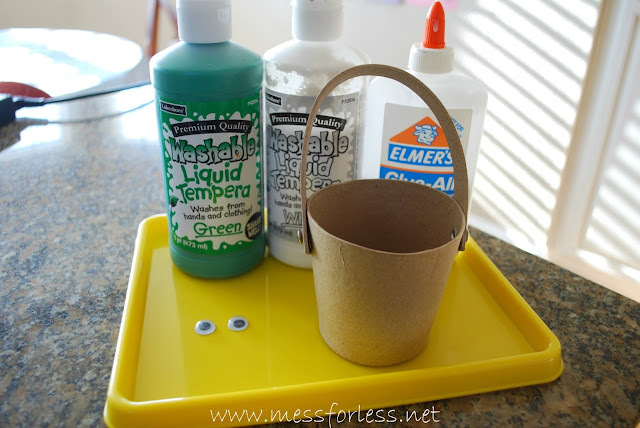 I mixed my green and white paint to get a lighter shade of green and poured some in a cup so my kids could paint their buckets. I put the buckets on paper plates to contain the mess while the kids painted. The handle was the trickiest part to paint. When it’s done, turn it over and let it dry. When the bucket was dry, we added some glue to the inside rim and pressed on some Easter grass. Next, glue on some eyes and draw a nose and mouth. We noticed that our leprechauns were looking a little ragged and the kids thought they needed a hair cut. Here they are post makeover. Much better don’t you think? Cute! We are making Leprechaun hats today. We'll have to give these a try this week too! These are adorable. Can't wait to see what activity you're going to use these for! Super cute! Especially with the big eyes!! Now, that's creative. Love the green hair and googly eyes. Of course they're leprechauns! So cute. Love the googly eyes too! Where did you source your cardboard buckets from please? This looks like great fun to make. Thanks for the idea. I love how adorable they are! Thanks for sharing at After School.